Akashic Books deserves kudos for their fine service to noir. Now coming up on the 80th volume overall, with a dozen or more in the works, one would be hard-pressed to find a more satisfying collection of contemporary short stories. And talent. Akashic has rounded up editors from Laura Lippman to Tom Franklin to the venerable Joyce Carol Oates to shape and manage each volume. Dufranne also deals with the larger issues of Belgium’s status among overlooked European countries. Brussels, it turns out, is its own multilayered city of French and Flemish cultures in addition to being an important international capital that is now, alas, also in the grim rollcall of cities that has been the scene of recent terrorist attacks. 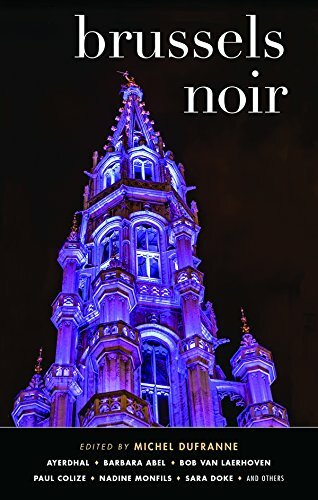 If these volumes are designed to give crime writers a nifty forum and also capture the local flair and flavor, Brussels Noir is a fine come-hither, complete with rough map locating each story’s setting around the city. Dufranne breaks the 13 stories into three parts: The Razor’s Edge, Sur(Realism), and Room to Maneuver. There are gems in each. “Daedulus” by Katia Lanero Zamora, is a race-against-the-clock yarn set in a bleak future where blackouts and fuel shortages drive desperation and microdrones monitor one’s office time. The story has a 1984 vibe. Is this a virtual reality? Or not? It’s harrowing and heart-pounding either way. Patrick Delperdange follows right on Zamora’s heels with a brisk entry, “Only Muddy Streams Flow in Darkness,” that is as funny as hers is dark. A tour guide named Pat is prone to reciting koans (as in, the title of this story) and Buddha-esque bromides. But he seems to have only one thing on his mind. I’m not sure how this story fits with noir, but it’s a fine slice of humor. We find out in a brief author’s note at the end of Paul Colize’s “A Fraction of a Second” that it’s based on a real events involving a woman’s search for her father’s assassins. This one is haunting and extremely personal. Ėmile De Béco’s “In The Shadow of the Tower” is an epic morality tale that wraps in journalism egos, terror, and pedophilia with a shocking, twisty end. Easy to imagine this story as full-length novel or television series (a la Broadchurch, say), but it offers a solid punch in this form, too.